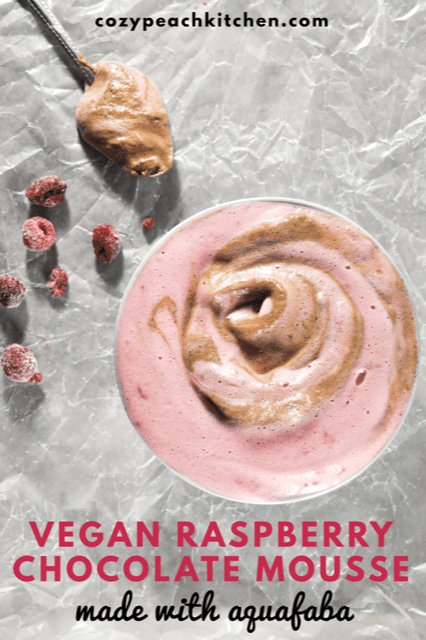 Vegan raspberry chocolate mousse is easily made egg-free with the magic of aquafaba. 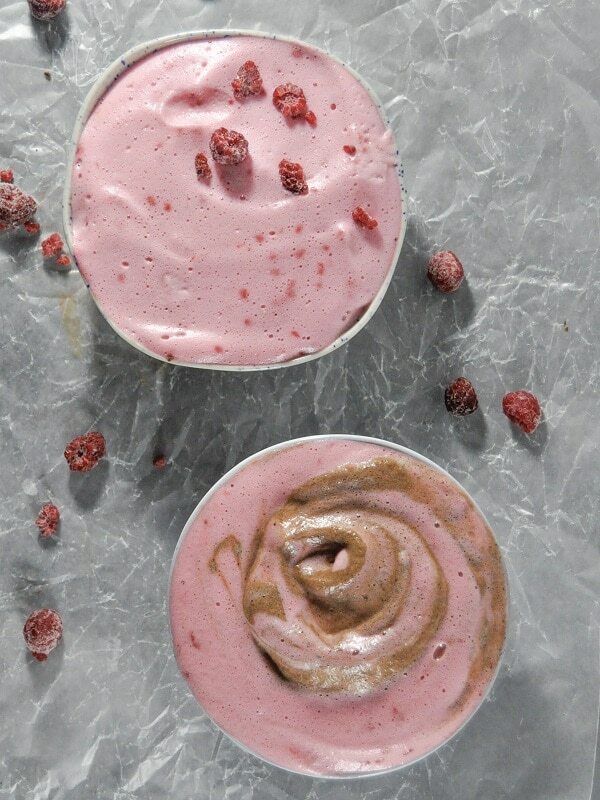 Whip up aquafaba, raspberries, and chocolate and just like that you have a fancy vegan dessert that tastes like spring. You know thick liquid you pour off of canned chickpeas before you rinse them? That’s aquafaba, a strange and wonderful thing integral to any dessert lover’s kitchen. Aquafaba can be used as an easy egg white substitute in many vegan desserts, like meringues or even buttercream. One of the reasons I spend so much time cooking, baking, etc. is because I love the science behind it. It’s part of the reason I love to bake bread, and part of the reason why I wanted to try out a new mousse recipe. Mousse is traditionally made with egg whites. Mousse is one of the first “fancy” desserts I ever made (back in high school, for a Valentine’s dinner – let’s not talk about that). There’s something fascinating about watching the egg whites form into stiff peaks. And somehow (science?) chickpea water does the exact same thing. Except, unlike egg whites, you can’t overwhip the aquafaba. Which is awesome, because it means that making this recipe just got that much easier. 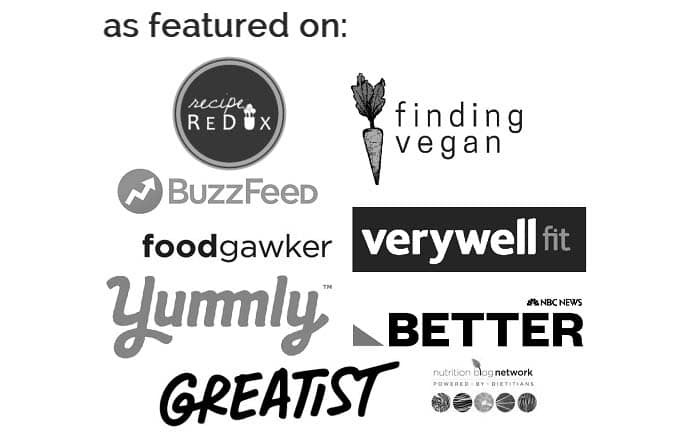 Interested in learning more about aquafaba? 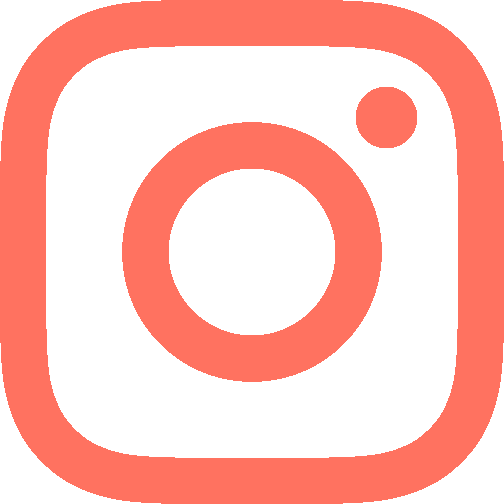 America’s Test Kitchen has an interesting article on acid stabilization and chickpea liquid and The Vegan Society shares some neat things to do with this “bean juice”. Use a stand mixer or handheld mixer and whip, whip, whip on high speed for 5-10 minutes, or until stiff peaks form. Add in the chocolate or pureed raspberries and lemon juice, then add the sweetener. Don’t be alarmed if the stiff peaks un-stiff peak themselves. Just resume whipping until stiff peaks form again. 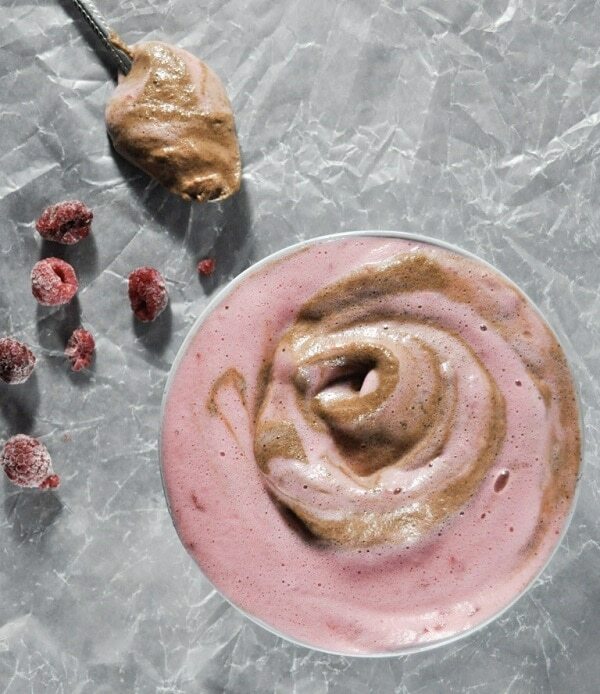 Pour the now fluffy vegan raspberry chocolate mousse into serving dishes and set in the fridge for at least three hours. This allows the mixture to cool and fully solidify. Mix chocolate and raspberry mousse together before or after refrigeration. 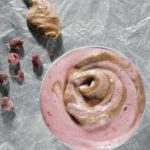 Aquafaba mousse is a delicious vegan alternative to traditional mousse. Heat chocolate squares in microwave safe container until melted, or melt using double boiled method on the stove top. Check and stir chocolate periodically to make sure the chocolate doesn't burn. Drain chickpea juice into a medium mixing bowl. Using a handheld mixer, whip the aquafaba (chickpea juice) on medium high until stiff peaks form. Scrape down sides as needed with a spatula. Stiff peaks are formed when the peaks stand straight up when the beaters are lifted from the mixture (about 5-10 minutes of whipping.) Mix in vanilla extract. Divide stiff peaks mixture in half. To one half, whip in lemon juice and raspberries. To the other half, whip in melted chocolate (make sure the melted chocolate is not hot to the touch before adding it in). Add sweetener to taste. You may need to rewhip the mixture after adding in the flavorings. Layer raspberry and chocolate mousse into serving dishes, or swirl together in a bowl. Let set in the fridge for at least three hours, or overnight. This allows the mousse to set completely.